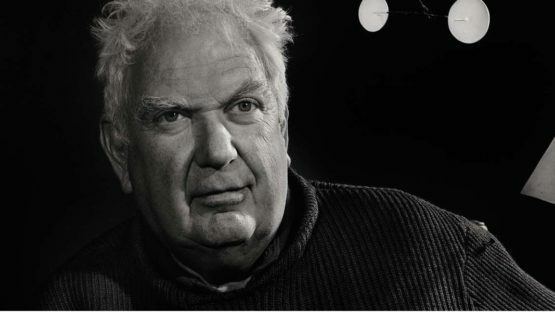 One of the most celebrated sculptors of the twentieth century Alexander Calder changed the course of modern art. His most iconic works, named ‘mobiles’ by his friend Marcel Duchamp, are kinetic sculptures in which flat pieces of painted metal objects connected by wire move delicately in the air, powered only by slight air currents or propelled by motors. He made vivid, not infrequently witty, use of natural and manmade materials, including wire, sheet metal, wood, and bronze. 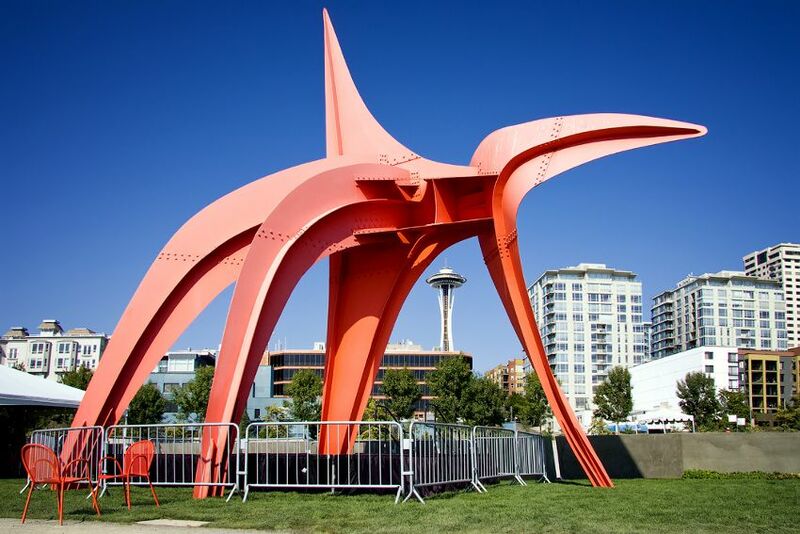 The American-born artist also made a large number of modern outdoor sculptures – called ‘stabiles’ – on a grand scale from bolted sheets of steel, many of which stand in public plazas in cities across the globe. Alexander Calder, known to his friends as Sandy, was born into a family of artists on July 22, 1898, in Lawnton – a small census-designated place in Pennsylvania. His mother was the a professional portrait painter Nanette Calder and his father was Alexander Stirling Calder, a sculptor who created many public installations most notable George Washington as President on the Washington Square Arch in New York City, and the Swann Memorial Fountain in Philadelphia. His grandfather, Alexander Milne Calder, was also a sculptor – a Scottish-American artist best known for creating the statues around Philadelphia City Hall. Calder’s sister was instrumental in the development of the Berkeley Art Museum and Pacific Film Archive. As a four-year-old he was the model for his father’s sculpture the Man Cub, now on display in New York’s Metropolitan Museum of Art. 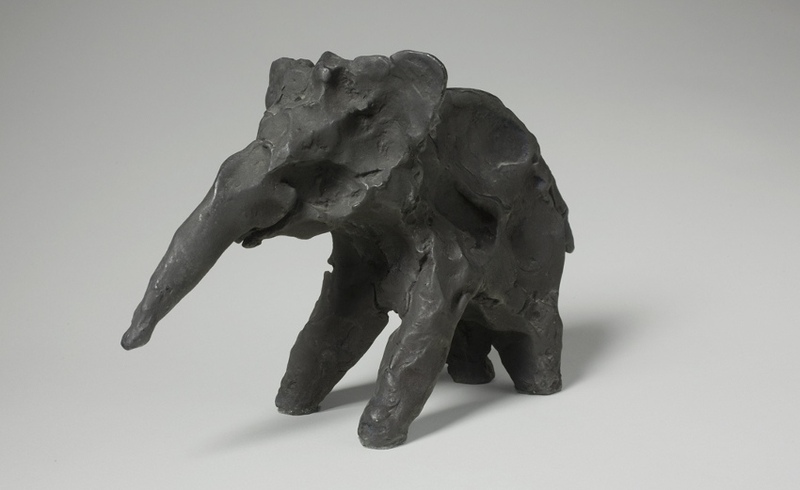 It is hard to believe that he created his first sculpture – little clay elephant – the same year. Almost three decades later, in 1930, he made a sculpture of bronze elephant that resembled his first clay sculpture. When he was seven years old, his grandfather contracted tuberculosis so his parents moved to a ranch in Oracle, Arizona, leaving the children in the care of family friends. The family reunited in 1906 and stayed in Arizona until the end of the year when they moved to Pasadena, California. There Alexander created his first studio at the windowed cellar of the family home. He used scraps of copper wire that he found in the streets to make jewelry and beads for his sister’s dolls. In 1909, the family relocated to Philadelphia and later to Croton-on-Hudson, New York. Calder’s first creations were a tiny dog and a duck made out of a bent brass sheet, which he gave to his parents as Christmas presents in 1909. The duck already showed his interest in motion as it could rock to and fro when gently tapped. In Calder’s early years in Croton, he befriended with Everett Shinn who would later become famous realistic painter and member of the Ashcan school, an artistic movement in the United States during the early twentieth century known for portraying scenes of daily life in New York, often in the city’s poorer neighborhoods. The two of them built together a gravity powered system of mechanical trains on wooden rails held by spikes. Calders did not stay long in Croton. All throughout his youth, his family moved from state to state, leaving Pennsylvania for Arizona, California, and New York. However, one thing was steady – in each new location, Alexander reserved a cellar space as a studio of his own. Finally, the American artist stayed his last high school years with friends in California so that he could graduate from Lowell High School in San Francisco in 1915. Despite his artistic talents, Calder enrolled at the Stevens Institute of Technology in Hoboken to study engineering. He received a degree in 1919 and started working as a hydraulic and automotive engineer, logging timekeeper and ship boiler fireman. One day in 1922 while working onboard, Calder woke up when the ship was passing the coast of Guatemala. The vision of both a rising sun and a full moon on opposite sides of the boat inspired the artist within. Enthralled by the scene he saw, Alexander moved to New York and signed up to the Art Students League in 1923. During his studies at Art Students League, he produced paintings of the Ashcan aesthetic and worked at the National Police Gazette, illustrating sporting events and the Ringling Bros and Barnum & Bailey Circus. The intricate motions and choreography of circuses inspired the artist to recreate the spectacle with his own circus models made from wire, leather, cloth and other materials. Calder’s original fascination with circus went back to his childhood years when his mother took him to the Tournament of Roses Parade in Pasadena, to watch a four-horse-chariot race. This style of the event later became the base of Calder’s wire circus shows. Now living in Paris, he visited the Académie de la Grande Chaumière and established a studio in 22 rue Daguerre in the Montparnasse Quarter. Soon after, he began to make toys, which he submitted to the Salon des Humoristes. 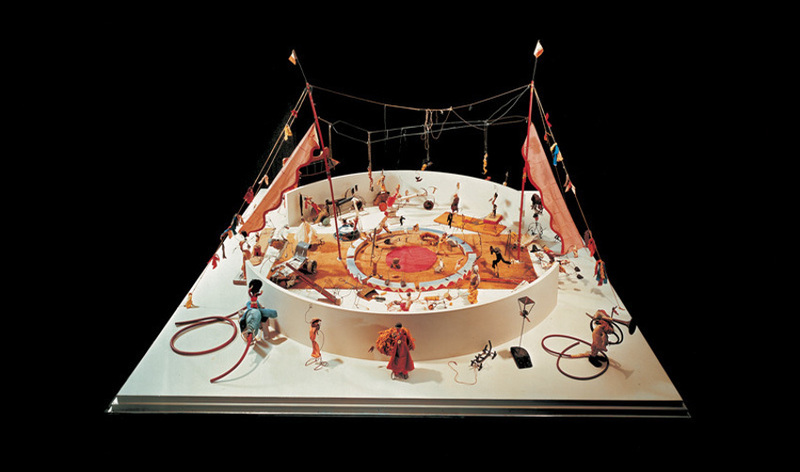 In Cirque Calder, the artist experimented with setting a large collection of miniature acrobats, animals, and other figures in motion using springs and pulleys, arranged in vignettes. Each vignette was designed to be operated by Calder himself while the music was playing. It is one of the earliest modern works in which the artist is equally involved as both a “maker” and a performer. The entire Circus was designed so that it could be packed up into a trunk. Calder’s assemblage pre-dated those of Rauschenberg for decades! Three films were made of Calder’s Circus performances, and the Circus itself gained so much attention that Calder was always between Paris and New York, staging renderings. On one of those Atlantic crossing, he has met his future wife, Louise James, the grand-daughter of Henry James, author of The Portrait of a Lady. Besides the fact that he found a loving wife thanks to the Cirque, this piece also gave him an insight into the Parisian avant-garde. Calder befriended with a number of avant-garde artists including Joan Miró, Jean Arp, Fernand Leger, Piet Mondrian and Marcel Duchamp. Mondrian’s colorful abstraction inspired Calder to start experimenting with abstraction. He even tried, at first, to paint in an abstract manner, but soon realized that he was a much better sculptor. At the same time, Calder came back to a toy design creating several kinetic wooden push and pull toys for children, which were mass-produced by the Gould Manufacturing Company, in Oshkosh, Wisconsin. Calder continued to create wire sculptures in three dimensions. Those were usually portraits of friends, animals, and other themes he found interesting. In 1928, he held his debut solo exhibition of wire animals and caricature portraits at the Weyhe Gallery in New York. Next year, the Galerie Billiet gave him his first solo show in Paris. The year of 1931 is considered to be a turning point for this artist. 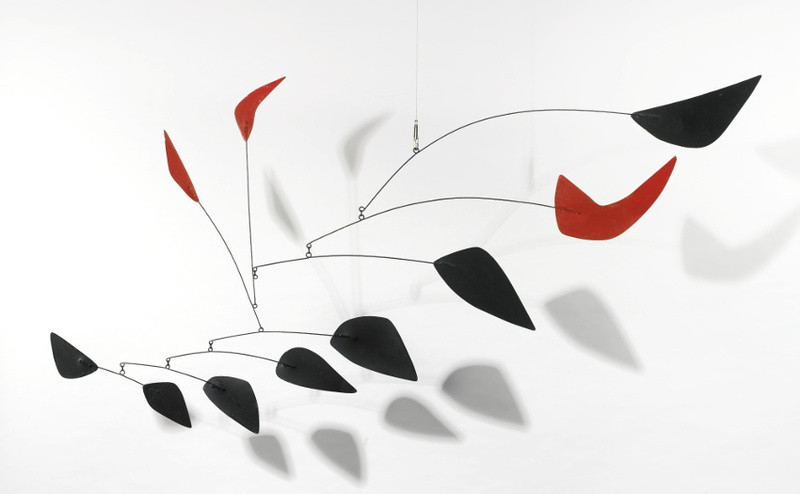 Calder began to create abstract, kinetic sculptures, initially animated by cranks or motors. It was Marcel Duchamp that christened these sculptures as ‘mobile’ – in French, mobile both means motive and mobile. Soon, Calder realized that if suspended in air, the cranks or motors are no longer necessary. The ambient air current would move the sculpture within its space. 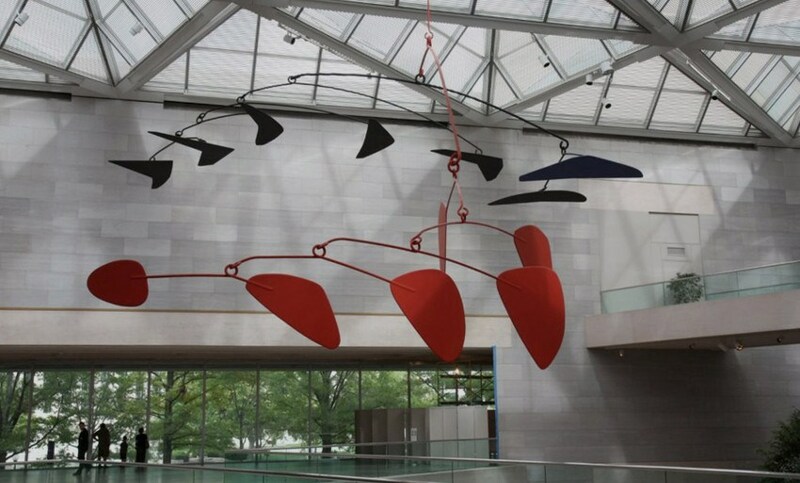 In the end of its evolution, Calder’s mobile could be defined as a kinetic sculpture made with delicately balanced or suspended components which move in response to motor power or air currents. The Calders returned to States in 1933 and bought a farmhouse Roxbury, Connecticut, where they raised their two daughters. There the artist created sets for Martha Graham ballet and still holding a rendering of Cirque Calder. In 1937, Calder completed Devil Fish, his first stabile enlarged from a model. Calder’s ‘stabiles’ revitalized a stagnant art form, reintroduced color to outdoor works, and championed the tools and materials of the modern age. During the final decade before his death in 1976, the artist received a large number of the commissions for public sculpture both in the USA and abroad. His monumental stabiles were sufficiently ‘modern’ yet not so radical as to look outmoded within a couple of decades. Among his many international commissions were those for the New York Port Authority (1957), and UNESCO in Paris (1958). WTC Stabile, also known as Bent Propeller, was commissioned by the Port of New York Authority in 1969 for the World Trade Center Plaza while the buildings were still being constructed. The piece was installed in 1970 and was destroyed during the 9/11 terror attacks. The term stabiles was coined in reference to Calder’s work by Jean Arp in 1931 but later was applied to similar works by other artists. 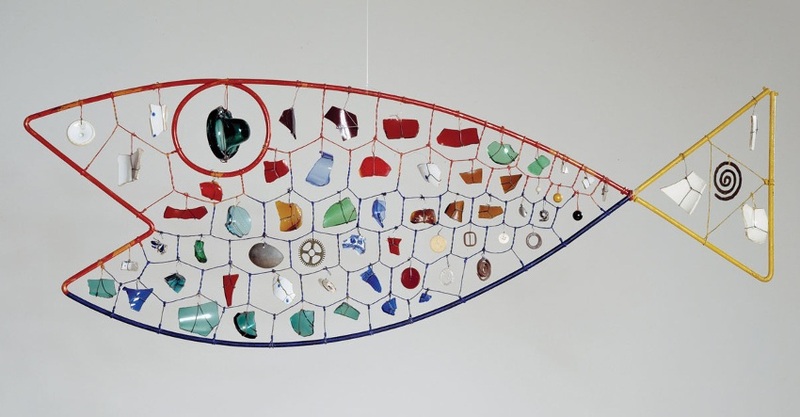 Calder was commissioned to create what he will name a Mercury Fountain for the Spanish Pavilion at the Paris World’s Fair in 1937, as well as to make a Lobster Trap and Tail for the main stairwell of the new Museum of Modern Art building in New York in 1939. 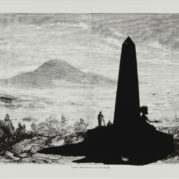 The first retrospective of his work was held in 1938 at the George Walter Vincent Smith Gallery in Springfield, Massachusetts. 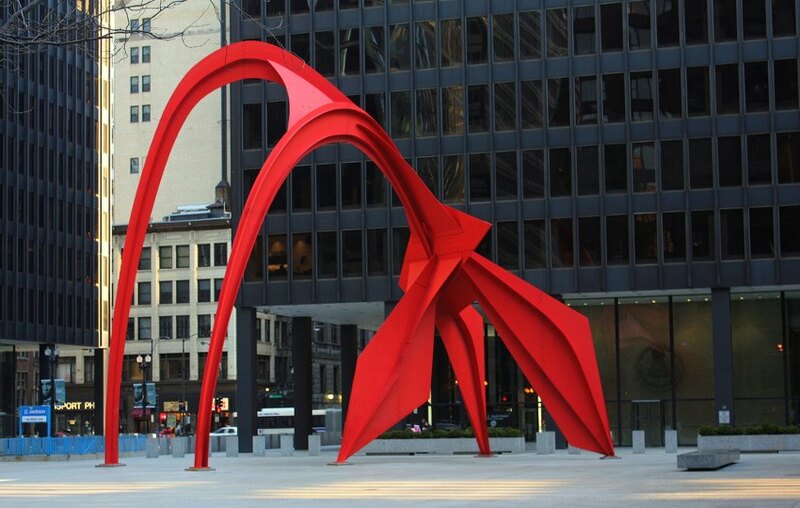 Calder quickly became one of the leading names behind the notion of moving sculpture. In 1943, he was honored as the youngest artist ever to have a retrospective exhibition at the art world’s most prestigious venue, New York’s Museum of Modern Art. Curated by James Johnson Sweeney and Marcel Duchamp, the show was so popular that it was extended into 1944. When the war broke out in America, Calder applied for the Marine Corps but was rejected. The war had the important consequences of his work: metal was being used for the war effort, so he relied more on wood. His most famous artworks from this period are the cosmologically inspired pieces he liked to call constellations. Calder was very eager to exhibit in Europe again, so in 1946 when the war ended he had a major show at Galerie Louis Carré in Paris for which Jean-Paul Sartre wrote a seminal essay. In 1949, Calder was one of 250 sculptors who exhibited at the 3rd Sculpture International at the Philadelphia Museum of Art. His piece titled International Mobile was the centerpiece of the exhibition and Calder’s largest mobile ever. In 1952, Calder represented the United States at the Venice Biennale, winning the Grand Prize for sculpture. During a yearlong stay in Aix-en-Provence, he created the first group of large-scale outdoor works. Calder also participated in the Documenta Kasel in 1955, 1959, and 1964. Calder was honored with the Presidential Medal of Freedom and the Bicentennial Artist Award from the Whitney Museum of American Art in New York City in 1976. He died that same year at the age of 78, having achieved worldwide renown. Internationally recognized for his original, whimsical pieces, Calder produced a wide-ranging body of work during his lifetime, including drawings, paintings, jewelry, tapestries, illustrations, prints, and set designs. Calder changed the course of modern art by developing his innovative method of sculpting – he shifted from figurative linear sculptures in wire to abstract forms in motion by creating his “drawings in space.” Calder’s fascination with balance, the natural world, and the cosmos made him one of the most influential artists of the 20th century.